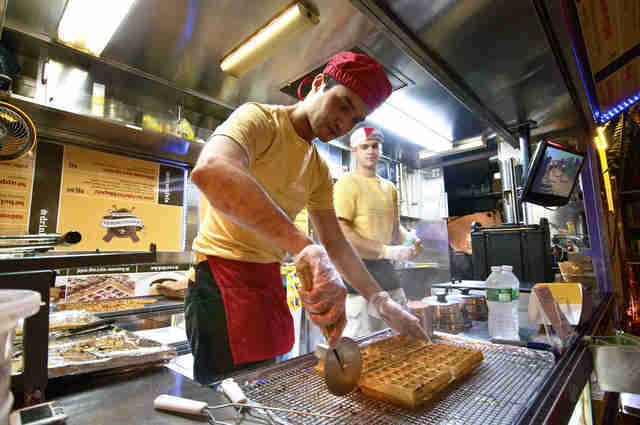 Screw your lobster rolls and $19 grilled farm-fresh duck legs: these are not food trucks. We’re talking about legit street food. 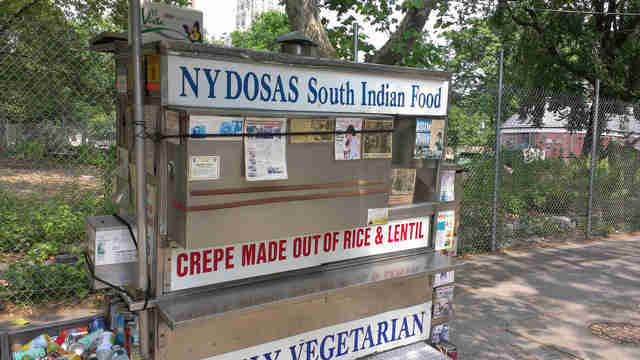 Eating from a genuine street cart is a delightfully universal experience in New York: typically, the people standing in line are a cross-section of the population, coming from a wide range of incomes and backgrounds. 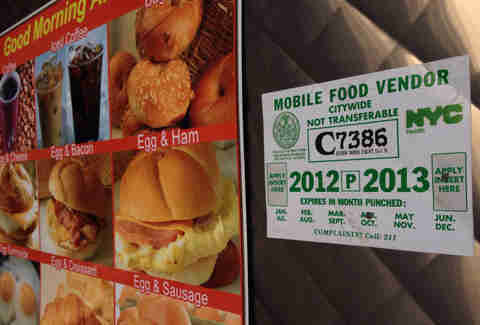 Everyone has an opinion about their favorite dishes, and they all want to talk about their old favorite carts that used to be just two blocks away, but closed or moved or changed ownership. To put it mildly, I love street carts. I love them so much, I once lived off them exclusively for an entire week. Which is why it was only natural that I would rank Manhattan’s best-known carts. Greasy, honey-roasted nuts that always smell better than they taste. Good for keeping your visiting cousin’s blood sugar up before contending with Times Square or whatever. They sling pastries that taste like prop food and coffee that tastes like sadness. However, a reader once tipped me off to a tamale cart on 39th and 8th Ave, which will sell you a bacon, egg, and cheese with salsa verde that is off the goddamn hook. Thank you, kind reader, and thank you, breakfast cart with salsa verde, for giving me breakfast cart hope. These are dirty-water dogs not even worth considering, especially when you know you can find a Sabrett stand nearby. Walk an extra block. It’s worth it. 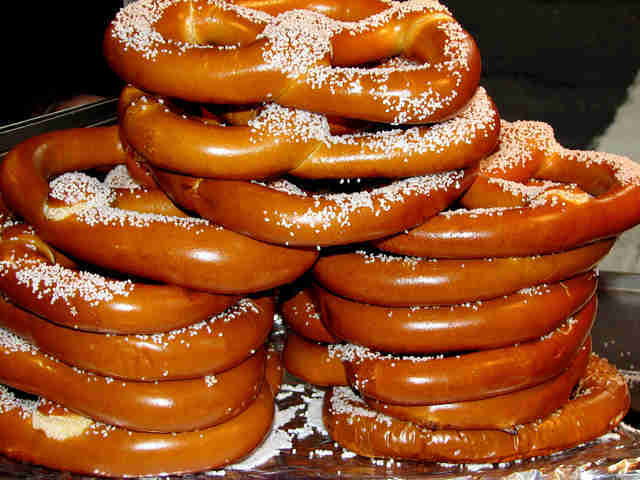 Nine times out of 10, the pretzels are dried out, crumbly, and stale. When you get a miraculously good one, you remember why they’re worth the gamble, but really, those weirdly rectangular knishes are the unsung heroes of these carts. The people who run this cart are so lovely, and the cart is so clean, but the bread is so meh, and a sandwich with lame bread is inherently disappointing. Food is love, indeed. Go for the whiting, not the flounder, in sandwich format -- delicious and cheap as all get out. Not a deal, price-wise, but seriously good soups. I once had a dream about the chicken gumbo. Vegetarian crêpes you don’t have to be a vegetarian to enjoy. The owner, Thiru Kumar, is just a lovely human being, and his coconut chutney is everything I’ve ever wanted in life. Infinitely better than the competition. Food of the gods. Can’t wait to get hate on Twitter for this. It’s not famous, but it’s magical. Totally traditional halal-cart fare, and one of the best lamb gyros in the city. Belgian waffles filled with chocolate fudge, speculoos cookie spread, strawberries, Nutella, and whipped cream. The best dessert cart in the city, bar none. Chicken over rice, all the sauces. These guys are great, and offer an incredible range of free, non-standard toppings (yes, please, to olives, black beans, and corn). Really, really good mai fun and fish balls, y’all. 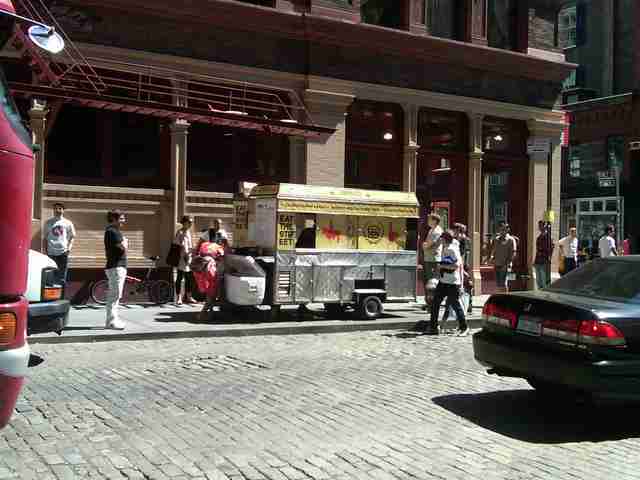 This cart has become a multi-location institution, and still offers one of the best lunches in Soho. Get the chicken mole or the carne asada tacos. The nicest lady in New York wants to make you a fresh juice for half the cost of what it is at the Whole Foods down the block. She uses a blender, not a juice press, so you get really good, whole juice, too. The chicken is juicy and delicious, but the burger is maybe the best in the city. Fighting words, I know. Ms. Julien kindly bestows the gift of Trinidadian cuisine on the Financial District. Pack a roti full of everything under the sun, or go for the short ribs... or that jerk chicken. You really can’t go wrong here. 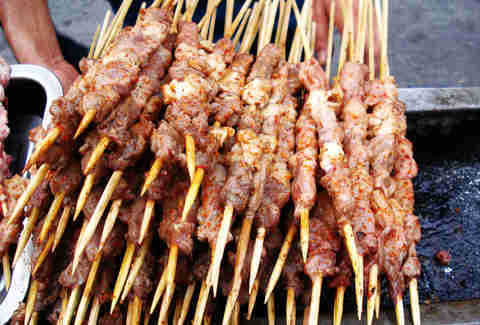 If it tastes carcinogenic, I’m down to try it, and the sticks that come off this grill are charcoal-smoky masterpieces. You can get the standards: chicken, lamb, etc., but this cart also offers up fresh-grilled squid and chicken hearts, so, you know, live it up. Just stop whatever stupid thing you’re doing and go to Harlem and buy this lady’s tamales. They are actual, real tamales, like in Mexico. They are better than we deserve. 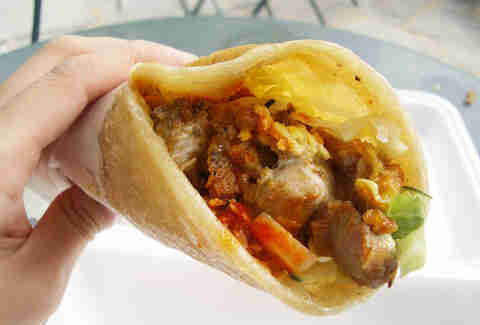 The kati rolls here are probably the best in the city. Plus, there’s insanely good tikka masala, solid vegetarian options, and that eponymous chicken biryani. This place is an institution. The stew salt fish is great, as is the jerk chicken, but it’s really all about the bake and shark, you guys. And the tamarind sauce. Mmm. 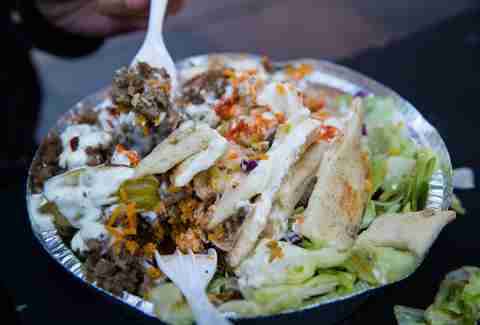 There are lots of good halal carts around this city, but as it’s been noted time and again: it’s that white sauce, y’all. The white sauce is what sets them apart. There’s a reason these guys are building a little empire. It’s not even really fair. 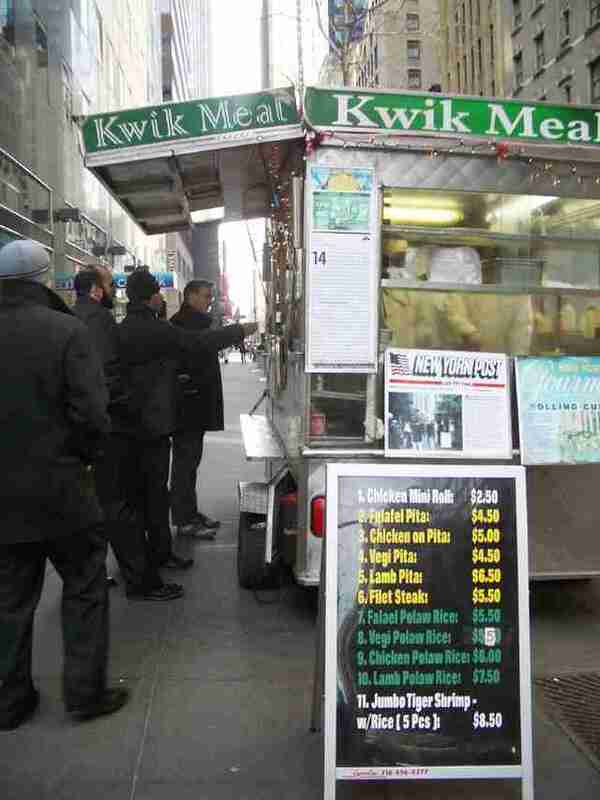 Kwik Meal Cart is owned by Muhammed Rahman, a former chef at the Russian Tea Room, who marinates lamb overnight in spices and green papaya. The food here is better than at most restaurants. Jess Novak once ate a New York City pigeon and didn’t even call it squab. You can follow her questionable life choices on Twitter and Instagram.